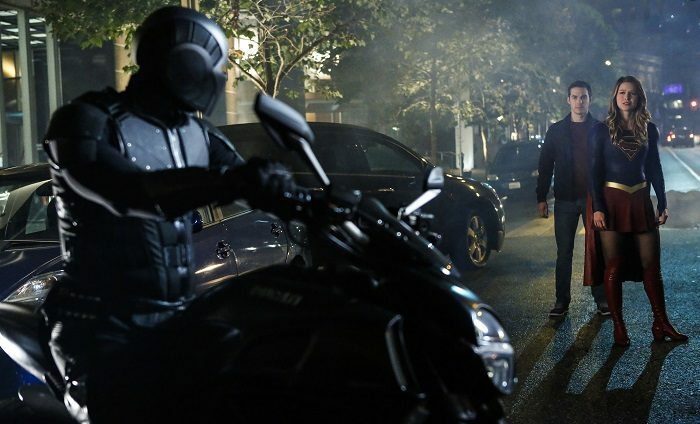 Another uneven episode of Supergirl gets the emotion right, but rushes the action. Warning: This contains mild spoilers. Read on for additional spoilery notes. “Change is good when you become what you’re meant to be,” we’re told in Episode 6 of Season 2, titled Changed. You may already have guessed what the theme of the episode is. 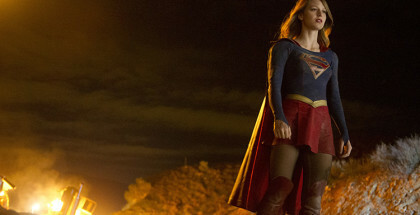 Supergirl is a show that has stumbled in recent weeks, in its attempts to change from Season 1. 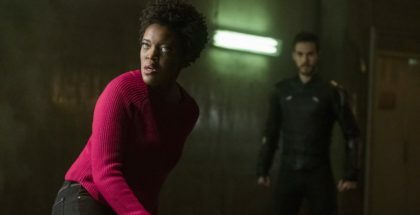 Its move to The CW has seen it grow up in terms of subject, themes and presentation, from fight clubs to X-Men-esque questions of humans versus aliens. Racing a little too quickly in its efforts to go bigger and further than its maiden run, which was focused on Kara developing her own character, this episode makes it clear once and for all that taking one’s time is the most effective approach. Unfortunately, it demonstrates that by rushing its biggest plot point. We begin, as all sci-fi should, in a sinister lab in the middle of Norway, as some scientists discover a wolf frozen under the ice for hundreds of years – a wolf that, against all scientific reason, is still warm. How? Why? The answer lies in everyone’s two favourite words: alien parasite. Sure enough, it’s only a matter of minutes until Dr. Rudy Jones (Lost’s William Mapother) has got his arm half eaten by the wolf’s stomach. The next time we see him, a slug is crawling in and out of his nose. It’s safe to say that things aren’t going well. Jones, though, isn’t the only one undergoing a transformation and, while the central monster is perfectly enjoyable, the episode doesn’t get both of its other two changes right. Enter James (Mehcad Brooks), who, upon seeing Kara in danger and laid up in bed underneath UV lamps, orders Winn to give him his suit, so that he can step up his hero game and help. “This is who I am,” he tells Winn, repeatedly, but no matter how many times he says it, it never sounds convincing. Olsen has often been an awkward character for Supergirl, moving from a neat nod to Superman to a romantic interest to a surrogate Cat Grant. Now, the writers are trying to push him into their version of the DC Comics’ Guardian character, and it’s not a comfortable fit. He’s tired of hiding behind his camera, he says, but isn’t photography meant to be a passion of his? And who on earth is running CatCo, while he’s indulging in his fantasies of being Iron Man? And why does no one question his constant turning up at the DEO without anyone inviting him? Do they not have security on the front desk of the secret government organisation? 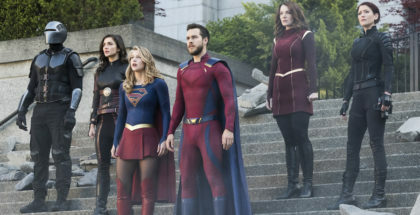 Patience works elsewhere too, as we briefly see Kara get drunk with Mon-El – a sequence that once again showcases Melissa Benoist and Chris Wood’s chemistry – and soon discover that he’s using his powers not to help people, but to earn money as a debt collector. Mon-El isn’t a hero, he insists; Kara shouldn’t force him to change into what she thinks he should be. Sometimes, the most intriguing changes are the ones thrust upon people. Well, as long as they’re not James Olsen. – Alex’s excited rush of emotion is gently turned into a heartbreaking pang, as Alex’s confession of a crush on Maggie is rejected by the kickass cop, who says that she’d rather just be friends. Not for the first time this season, we see Alex walk away in silent tears from a conversation, but it’s a beautiful reminder of how good Supergirl is when it paces itself; these are early days for Alex and the writers know that there is still time to develop her character over the rest of the season. – If only they had the same patience with James, Guardian might work better – look at how long it took Ray in Arrow to developer his ATOM suit, a slow-burn evolution that led to his own spin-off series. At this stage, you can’t ever imagine Guardian deserving one of those, because apart from an urge to help Kara, there’s just no substance to him. – It doesn’t help that when Guardian does suit up, he looks like a budget Downey Jr. wannabe, with a Captain America-style shield that can absorb and rebound enemy weapons and a helmet with a slit for his eyes. Despite Mehcad Brooks’ earnest performance, all of it feels like it’s been accelerated before feeling fully ready. – Even worse, James decides to lie to Kara and not tell her what he’s doing – a move that makes the least sense of all, apart from the fact that it gives the writers a chance to have a dramatic showdown later in the season. – Mon-El has a good point and he remains an interesting character with potential to go either good or bad – a potential underscored by Cadmus kidnapping him right at the episode’s end. What will they do with him? 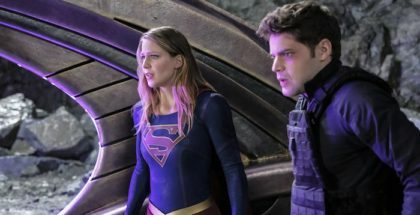 – Combine that with the blood donated by M’gann to save J’onn’s life (which she doesn’t admit is White Martian blood, rather than J’onn’s Green Martian blood – a final shot leaves his hand trembling) and Episode 6 of Supergirl’s second season leaves us with a number of tantalising questions waiting to be answered. Waiting, of course, is half of the fun.